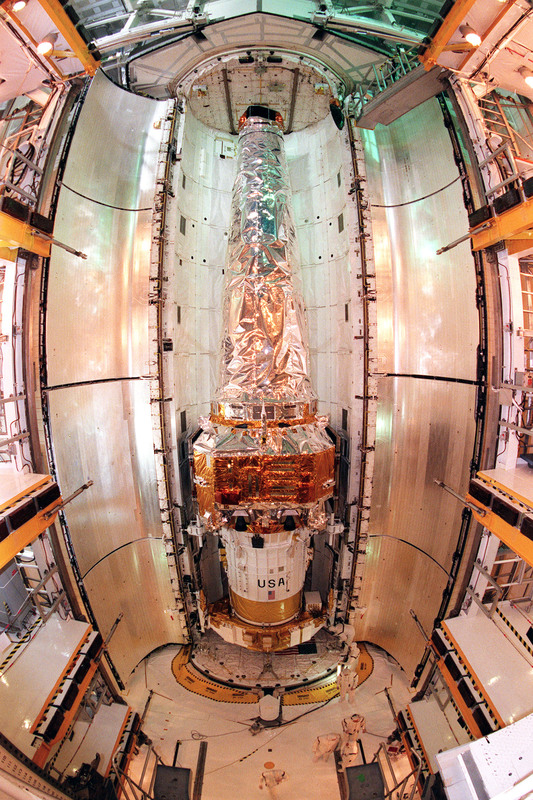 Opis: Wrapped in protective blankets and mounted atop an Inertial Upper Stage (IUS) rocket, the Chandra X-ray Telescope is seen in this wide-angle view before launch snuggled into the space shuttle Columbia's payload bay. Columbia's crew released the telescope, named in honor of the late Nobel Laureate Subrahmanyan Chandrasekhar, into orbit on Friday, July 23rd, where it is now undergoing check out and activation of its scientific instruments. To help realize its enormous potential for exploration of the distant Universe at X-ray energies, controllers will perform a series of firings in the coming days which will eventually boost the 10,000 pound telescope into a highly ecentric orbit. In fact, the final working orbit for Chandra will range from a close point of about 6,200 miles out to 87,000 miles or one third of the distance to the Moon. The elongated orbit will carry Chandra's sensitive X-ray detectors beyond interference caused by the Earth's radiation belts allowing Chandra to make about 55 hours of continuous observations per orbit. The shuttle Colombia, commanded by Eileen Collins is scheduled to land this evening at 11:20 pm EDT at Kennedy Space Center.